One time Baltimore Oriole and Tampa Bay Devil Rays outfielder Danny Clyburn was shot dead this week in South Carolina. Police are investigating the murder. Virtually every single article on line about Clyburn is now about his murder and no doubt more will be written as facts come to light. 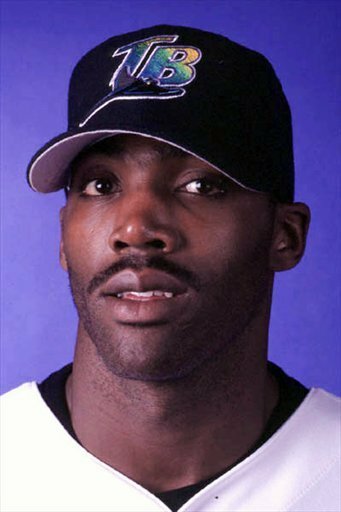 Clyburn played 41 games in the majors. Chances are that's 41 more games than you ever played in the Show. And today, instead of focusing on the tragedy, let's look at his greatest moment on the field. On April 11, 1999 the lowly Tampa Bay Devil Rays were playing the Boston Red Sox in St. Petersburg. The D-Rays jumped ahead to a 4-0 lead against Pat Rapp but Wilson Alvarez , Esteban Yan and Rick White couldn't hold it. Jeff Frye's 2 out RBI single in the 7th tied the game and it became a battle of the bullpens. In the 8th inning the Devil Rays sent up three seasoned veterans to face Red Sox reliever Derek Lowe. Jose Canseco, Fred McGriff and Wade Boggs all batted that inning. Lowe retired each of them. But sandwiched between McGriff and Boggs, Lowe had to pitch to Clyburn. He responded with a 2 out solo home run to give the Devil Rays a 5-4 lead. Roberto Hernandez pitched the 9th inning, striking out Nomar Garciaparra to end the game. I don't remember that game specifically but no doubt I followed it somehow. (Probably on an AOL Sports ticker in 1999.) And chances are I said "Damn it. We got beat by Danny Clyburn? Are you kidding me?" For at least one night Clyburn was not only a big leaguer but a clutch slugger in a line up filled with All Stars and a future Hall of Famer. And I hope he is remembered more for that homer than whatever details surface from this investigation. Rest in Peace, Mr. Clyburn. Sad story, well beyond baseball. I wish all the best to his family.